Each of us is creating a legacy. The influence of our lives will leave an imprint on all those the Lord has brought into our lives for us to touch. This proverb reminds us that our legacy will live far beyond us. If our lives are righteous, that legacy will be an ongoing blessing as stories of our lives are passed on to future generations. 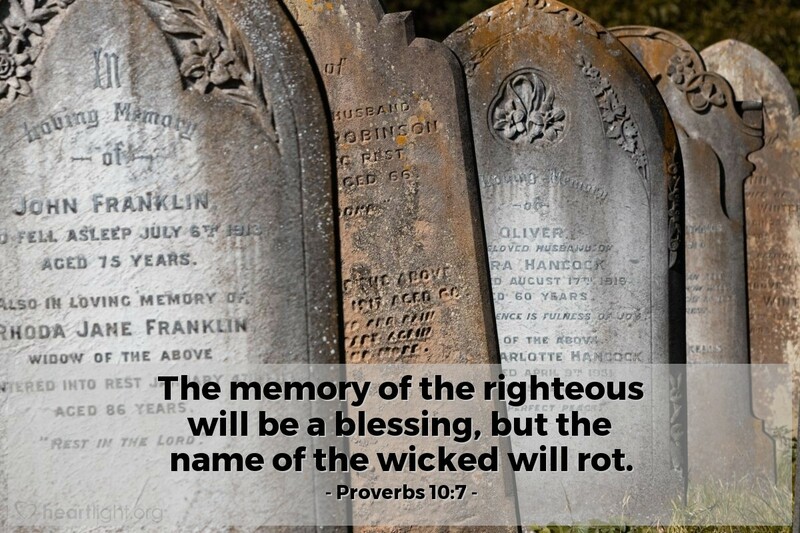 On the other hand, if our lives have been given over to wickedness, we will leave behind the lingering stench of something useful gone sour and something lasting given over to rot. O mighty God, may my life be a sweet blessing to my children and my children's children — whether those children are physical or spiritual. May my influence bring you glory and also bring others to know you and your grace. Forgive me when I fail to see the length of the shadow my influence casts and help me to see those you have purposely sent my way to touch with your grace. In Jesus' name I pray. Amen.